IMARK Auto coder for on-line printing on corrugated cartons, paper bags, cement / asbestos etc. which move on continuous conveyor. It does automatic registered coding of packaging information on cartons moving on automatic conveyors or taping machines. It is equipped with a tension spring that returns the marker to its zero position after every stroke. In the process the type gets re-inked as it passes below the ink roller and is ready for use again. Individual alphanumeric type provided to compose almost any type of information that you wish to mark. It gives good impression quality at very reasonable prices. A set of individual alpha-numeric types that can be used to compose almost any information to be marked, is also available. Type sets are available in size 3mm, 4mm, 5mm, 6mm, 8mm, 12mm, 14mm, 20mm, 25mm, logos emblems, monograms etc. can be made to order as per the design and artwork. I Mark coding Solutions was established in the year of 2007 with the experience about 10 years in coding and packing industry we understand the need of the customer.We are the fastest growing organization in coding & marking sector with wide range at coding machines. It suits to food, dairy, distilleries; lube oil, breweries, etc. 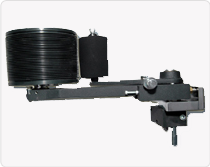 I Mark Coding Machines are supplied to Government, Semi-Government, Public Ltd and Private Companies.We are supplied to the top packing machines manufacturing companies and it reaches various destinations in India.I Mark have a wide range of dealers net work in all parts of India to serve the coding needs.